Should referees’ words be broadcast? Earlier this year I had the pleasure of meeting and talking to Premier League referee, Mark Clattenburg, for the first time. The thing I hadn’t realised about him is that he has what we would call a very pronounced ‘Geordie’ accent. Our discussion was of course about football and by chance, something that has become relevant – verbal abuse. Mark couldn’t remember the current phrasing in the Law. It is not as it was for years and as many people still refer to it, ‘foul and abusive language’. I reminded him that it now says ‘offensive, insulting or abusive language or gestures’. To that of course you can now add, if you are from Chelsea FC, ‘inappropriate language’. I don’t know more than anyone else of course, what was actually said at the Chelsea game and on such a slight acquaintance I am obviously not in any position to pass comment. What it has done however, is to have given rise to a lot of discussion about the radio system that is used by officials in professional football. The referee and his two assistants are switched on throughout the game and can talk to one another at any time. The fourth official is also miked up but he has to switch-on to talk to the referee. One demand has been to have these conversations between officials recorded. 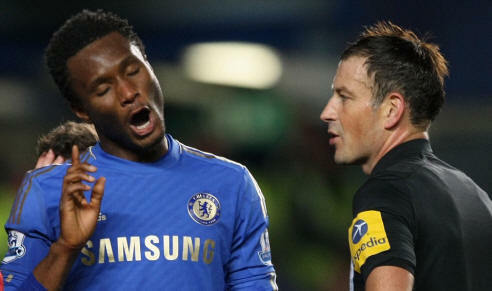 This then would have preserved the actual comments that Clattenburg made to Mikel. This would however seem to present a bureaucratic nightmare, it is after all a device simply to improve communication between the referee and his team especially for incidents out of the referee’ sight. It was claimed for instance that Zidane’s head against Mario Materazzi in the 2006 World Cup was not seen by the referee but his attention was drawn to it by the fourth official over his radio. This was denied but it shows the sort of incident that the system can be used for. The other suggestion is for the referee’s comments ‘on air’ to be made available to a wider audience as it is in rugby union. If you watch rugby on television you can hear the referee asking clarification from the television referee, as well as listening to what he says to players plus what the players say when in range. It is also possible I understand that when you attend a match, you can hire a small radio receiver that lets you hear all of this for yourself. It has been suggested that this is a practice that football could follow. There are two points of view over this. Firstly, many in football feel that if spectators could hear the sort of language used by players it might turn them off the game or make amateur footballers believe that this is not just the normal but the correct way to behave. We have had a real example of this recently in the John Terry case. Imagine if we had heard not just those three words that he admitted to using to Anton Ferdinand but also the taunting by Ferdinand to Terry about his off-field relationships. Constant revelations of this sort may turn our conception of football as the beautiful game instead to the nasty game. However there are others who side with Brian Moore, the former England rugby international, who believes that if players knew their language was going to be common knowledge, they would temper what they said. He felt that the behaviour of rugby players, towards the referee, was in a great deal, due to this factor. I’ve often expressed the feeling that if we could remove much of the antagonism and verbal aggression from the game, it would be far better not just for referees but for the game itself but I can’t see this will be the way to do it.